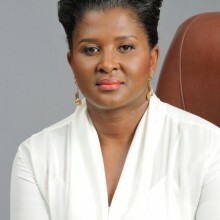 Madame Monica Geingos, First Lady of the Republic of Namibia is a qualified lawyer. Before becoming the First Lady in 2015, Madame Geingos spent 15 years of her professional career in the financial sector, as a private equity and governance expert. She was awarded National Honours (Most Distinguished Order of Namibia) for ”outstanding contribution to the socio-economic development of Namibia” and was inducted into the Namibian Business Hall of Fame. She has also received numerous awards such as the Namibian Business Personality of the Year and Most Innovative Entrepreneur of the Year. Madame Geingos has served on the Boards of large public and private sector companies as either Chairperson or Deputy Chairperson. Madame Geingos combines her professional expertise with her passion for enterprise development to focus on youth entrepreneurship and the integration of rural and urban economies. Madame Geingos will apply her energy towards Enterprise Development and Entrepreneurship, Integrated Early Childhood Development; Gender Based Violence Response and preventative Programme; Health; and Institutional Strategic Support. In May 2016, Madame Geingos launched the One Economy Foundation (ONE) which is the implementing arm of the the Office of the First Lady is and engages in projects which are evidence-based and focused on targeted outcomes. Madame Geingos is both the Founder and the Executive Director of ONE. In September 2016, Madame Geingos was appointed UNAIDS special Advocate for Young Women and Adolescent Girls. In this new responsibility Madame Geingos will champion the Start Free Stay Free AIDS Free Campaign, a global framework for ending AIDS among children, adolescents and young women by 2020. In November 2016, she launched the #BeFree Movement which is an implementation of her role as UNAIDS Special Advocate. #BeFree concerns itself with the challenges holding young people back from reaching their potential and seeks to create awareness about issues affecting them while addressing systemic issues that limit their ability to access information or services . In addition to this, Madame Geingos has also launched a Stay in School Initiative which encourages Secondary School learners to focus on moving obstacles that prevent them from completing school.